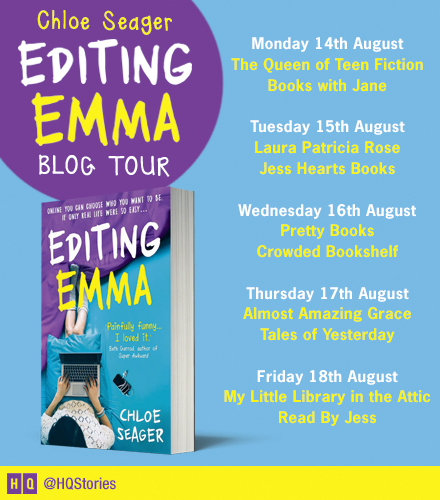 'Editing Emma' Blog Tour | Almost Amazing Grace. Welcome to my stop on the epic, exciting and exceptional 'Editing Emma' blog tour! I am thrilled to be blogging about this book – and not for the first time, either! I can safely say this YA is going to be one of the 2017's biggest and best. The excellent Chloe Seager has an immeasurable talent for creating characters and writing with a clear voice. 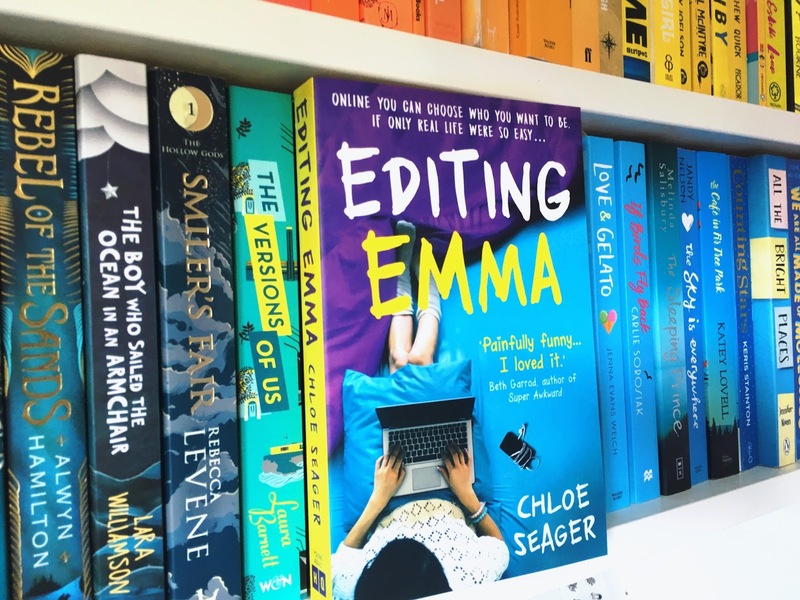 Emma explodes out of this book, and I found myself loving and relating to her from very early on in her blogging journey. In fact, she reminded me of the young Grace, sitting in her college library at lunchtime, typing furiously to everyone and no-one when she first set up her blog...but the less said about her, the better. Everyone probably has a traumatic or embarrassing story about their love life hidden away somewhere, and throughout my younger years I had my fair share of bizarre crushes and bad dates. I thought I’d round up a few of my biggest and most disappointing, and ask you all to join hands and thank heaven that I found my boyfriend when I did. First were childhood crushes. I’m not even sure they count as crushes per se, but they can form such a significant part of growing up. I was o-b-s-e-s-s-e-d with the boy who lived next door to me, who I used to play ‘doctors’ with (didn’t we all have a pal we used to play questionable games of ‘doctors’ with?) One day he left his undressed action man climbing the ivy trestle outside my window. I was sure it had to mean something. Like Romeo throwing stones at my window, but instead of stones a tiny, naked man? After trying to decipher the meaning for many months, it turned out he just forgot it. Whatever. Next came celebrity crushes. My eleven-year-old self found a strange sort of sexual awakening in Johnny Depp playing Jack Sparrow. I went to see Pirates of the Caribbean nine times at the cinema. Nine times. (What’s more, can I ask, who lets an eleven-year-old go to see a film nine times? And actually pays for it? My mother, I guess.) My Mum actually took me to the premiere of Finding Neverland so I could stand outside and see Johnny Depp - and see him I did. I actually met him. He signed my autograph and it was a magical moment… But literally a moment, because I suddenly realised how he looked nothing like Jack Sparrow in real life. Then came teen crushes. The scariest and most intense of all. I will bet you that in every single school across the globe, you will find unsuspecting older students who, unknown to them, have a secret group of devoted admirers in lower years, who have dubbed them with a range of totally uninspiring nicknames. Ours were ‘Art Boy,’ (oh Art Boy, the way you moved that pencil), ‘Hot Boy,’ (he was hot), and ‘Big Eyes’ (those really were some giant eyes). I will also bet you that in every single school across the globe, you will find that same group of devoted admirers heartbroken that ‘Art Boy’ never stopped being ‘Art Boy’ to become ‘Tom,’ or whatever. Or, that if ‘Art Boy’ did indeed become ‘Tom,’ ‘Tom’ was probably boring, arrogant and not at all the charming, witty and attentive man of their dreams. My own ‘Art Boy’ was actually pretty charming, but also turned out to be gay, so sadly definitely not interested in me. The teenage years were also when dating entered into the mix. One of the most disappointing dates I ever had was also the one I was most excited for. I met this boy fleetingly at a party, who had a My Chemical Romance bag. I REPEAT: A MY CHEMICAL ROMANCE BAG. Surely, this meant love? Our glance met across the room and we both eyed each other’s Three Cheers For Sweet Revenge ensembles. We swapped numbers and arranged to meet up, and I couldn’t stop thinking about how great our date was going to be all week. It was clearly meant to be. But for some reason, on the actual date, we didn’t appear to have that much else in common. It turns out a shared passion for wearing Gerard Way’s blood spattered artwork isn’t a strong basis for a relationship. Who knew? Throughout all this, I’d love to say I’d learned something from each and every encounter. I’d love to say each disappointment brought with it new and life-changing wisdom; useful knowledge that I might pass down the generations from my sage throne of romantic experience. But in all honesty, I entered into adult life with probably as little clue about the mysteries of love as I’d ever had. (Does anyone ever get a clue?) I hoped, though, that reading about Emma’s dating disasters might at least make someone laugh and feel less alone in their own seemingly endless cycle of disappointments. RT this & follow me!